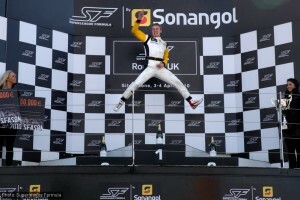 The Tottenham Hotspur driver, who celebrated his 22nd birthday during the week, showed once again that he is not intimidated by opposition with GP2, IndyCar and Formula One experience by establishing a 22-point lead in the championship standings. But James Walker, taking up the reigns at defending champions Liverpool, had a nightmare weekend in which he failed to finish either race and scored no points. 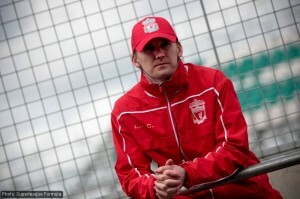 Duncan Tappy, who was named as driver for Brazilian club Flamengo at the last moment, made light of his hasty preparations by finishing third in the opening race – just as he had done when driving for Spurs in the championship’s debut year, 2008. But he could make little progress in the second race and just missed a place in the super final. Saturday’s qualifying saw Walker, Dolby and Tappy take third, fourth and fifth on the grid, behind FC Basel’s Max Wissel and Alvaro Parente for FC Porto. But when the rolling start of the opening race reached the first corner, Dolby had found a dry line on a damp track and was already launching himself up the field. By Maggotts he was in the lead and by the end of the third lap his advantage was 10 seconds. Behind him, Tappy took Parente and Walker for third, then inherited second when Wissel had a lurid encounter with the mud left in the run-off areas by building work and dropped down the field. Shortly after, Walker span into retirement. Sebastian Bourdais’ race was ruined by a botched pitstop that cost him a lap, but Dolby and Tappy emerged from the stops still holding the top two places. Dolby was in no danger of defeat and took and commanding victory, but Tappy found himself under pressure from the faster cars of Yelmer Buurman for AC Milan and Parente for FC Porto. He had no answer to the Dutchman, but defended well as the Portuguese swarmed all over the back of him and held on for the podium. Dolby said: “Boy, oh boy, what a first corner – passing four cars like that was something special. After I got all three guys in the first couple of corners I thought it would be difficult, being the first person, to see where the grip was. 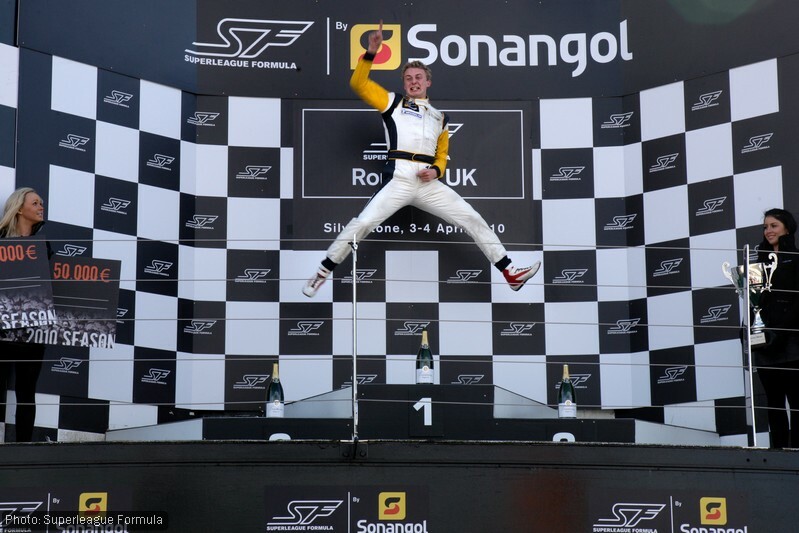 For Tappy, who has struggled to fund his career since winning the 2007 Formula Renault title, just having a drive was something to celebrate: “I keep using the phrase ‘over the moon’ this weekend. I said if I got into the qualifying quarter finals I would be over the moon, said if I’d make the podium I’d be over the moon, so now if I make the super final, I will be over the moon. Sadly for his ambitions, very few of his rivals did that. A reverse grid front row of Walker and Bourdais left little scope for ambition, and they were joined at the front by two drivers who had underperformed in race one because of picking the wrong tyres on a drying track, Chris van der Drift of Olympiacos and Tristan Gommendy of Galatasaray. 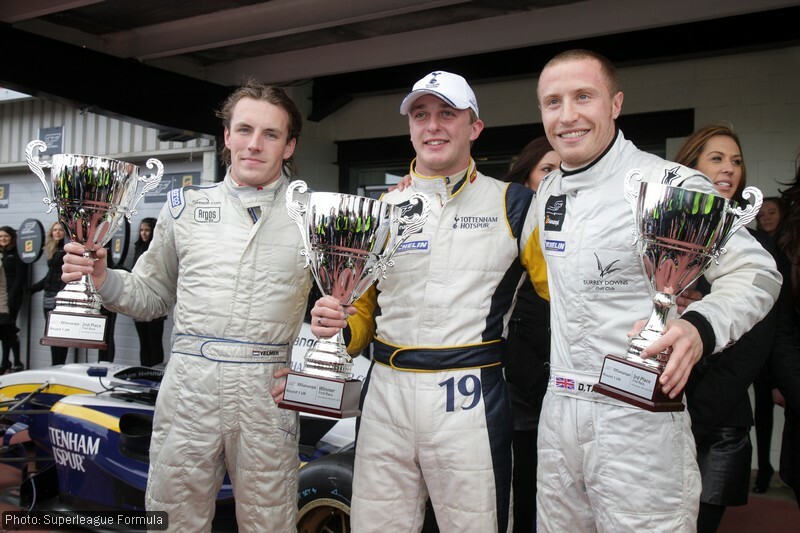 The race one podium drivers were joined at the back of the grid by Franck Montagny of Bordeaux, who had failed to start the previous race, and of the four it was Dolby who found the pace to work his way up the field. At the front, a busy Bourdais made short work of Walker and set about building a lead that could survive anything his team might throw at him during the pitstops. In the event, a sticking wheel nut dropped him to third, but he re-took van der Drift and Gommendy without great difficult to win comfortably. By then Walker was out, having been forced to let the entire field past when he spun, then retiring in the pits. Van der Drift held on to second, but Gommendy was given a drive-through penalty for taking his pitstop before the allowable window. This opened the third slot on the podium to the winner of a battle between John Martin for Atletico de Madrid and Dolby, the Australian hanging on as the Brit suffered from an equipment failure that prevented him from turning his head to the right. Dolby’s performance guaranteed pole for the five-lap, six-car super final, which began from a standing start, and he was joined there by Parente, Wissel, van der Drift, Bourdais and Martin. Parente got the best start, but soon ran wide and dropped to last. Dolby took over the lead and never looked back, while Wissel kept him in site for second without ever closing. Van der Drift held off Bourdais for third, while Parente recovered to fifth. Dolby said: “It was my birthday on Wednesday so this a fantastic late present. We’ve had a great weekend and although I was confident coming into the races, I have to admit that I was surprised by quite how fast we were. I was there yesterday, circuit was a bit of a mess with all the building works, and not a huge crowd, but some awesome racing – those cars are amazingly loud and quick, and with the sun glinting on them, they look so shiny. Very fun, hopefully will be at Brands Hatch later in the year to see them again. Fun’s a good word for it – we were cynical early about Superleague but seeing the cars close-up at a media day, then going to Donington last year, put an end to that. Categorised under Superleague Formula, tagged under Craig Dolby, Duncan Tappy, Flamengo, James Walker, Liverpool, Superleague Formula, Tottenham Hotspur.